Many of us in Los Palacios have fine views over the Vega Baja to the mountains. To be honest that's what sold our place to us, the first time we stood on the example roof terrace the sun was sinking behind the distant mountains, its a sight we never tire of and is never the same twice. The Vega Baja (Valencian: Baix Segura) it is the southern most district of Alicante spreading as far as Elche - Europe’s largest palm forest to the north and to the historic city of Orihuela in the South. La Vega Baja is divided by the River Segura which flows into the Mediterranean Sea at Guardamar. Despite having lived here for over 4 years we still find little corners we have not explored. I thought it would be a good idea to give you a little news from the wider area, tell you what the neigbours are doing so to speak. One thing they are not doing is, at least if they are in the Guardia civil*. is printing out important documents cos they've run out of ink! I kid you not. This same body it seems are looking less than there normal smart selves and they have till now been a smartly turned out lot. It seems they are not only waiting for ink cartridges but also for new uniforms. Times are hard for everyone it would appears. Last week there was a demonstration in Orihuela. Around five thousand people marched to protest against the quality of health care in the area and the use of private hospitals. I wish we got news of these things before they took place, I have often seen reports about protests that I would have like to supported. Now a word about trains, I have used the rail system a number of times and found it first class. The Alicante-Murcia route, which has suffered more than most from dilapidated cars, is to be upgraded with new, faster diesel trains which are capable of speeds of over 160 km per hour and which can carry up to 165 passengers. The new stock will include 103 AVE high- speed trains and it is hoped that the improved service will attract 150 million new passengers over the next two years. 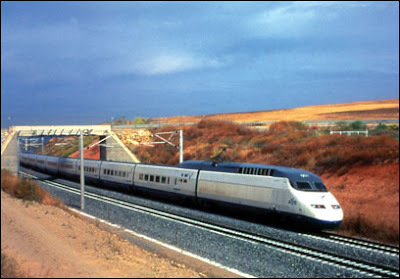 Alicante will see the upgrading in the first quarter of 2009, in particular on the route crossing the Vega Baja to Murcia. The government of Valencia has made it clear that improvement of rail services is a top priority Residents of Orihela are none to pleased to find the high speed trains will not be stopping in the city. Its hoped the faster communication will help improve commerce in the area as well as tourism. For my self i thought the service was excellent as it was. but that's what they call progress I suppose. *The Guardia Civil is the Spanish gendarmerie: it is a police force that has both military and civilian functions. It has foreign peace-keeping missions and maintains military status and is the equivalent of a federal paramilitary police. As a police force, the Guardia Civil is comparable today to the French Gendarmerie, the Italian Carabinieri and the Dutch Royal Marechaussee as it is part of the European Gendarmerie. The Guardia Civil uses as its leading emblem the motto "El honor es mi divisa" (Honour is my emblem) stressing its esprit de corps and pointing out the importance of honour. Their precincts are called "casa cuartel" (army house) and, like other military garrisons in Spain, they appear under the motto "Todo por la patria" (All in the service of the Mother/Fatherland).